Happy birthday to Paul Erdös, who would have been 100 today if he were still with us. This Hungarian mathematician, was one of the 20th century's top math experts and pioneered the fields of number theory and combinatorics. The type of mathematics he worked on were beautiful problems that were simple to understand, but notoriously difficult to solve. He loved to set problems for others to solve and would often offer cash prizes as rewards for correct solutions to the problems. These rewards ranged from $5 to $10,000 depending on how difficult he judged them to be. At age 20, Erdös discovered a proof for a classic theorem of number theory that states that there is always at least one prime number between any positive integer and its double. In the 1930s, he studied in England and later moved to the USA. His Jewish origins made a return to Hungary impossible. However, he was affected by McCarthyism in the 1950s and he spent much of the next ten years in Israel. 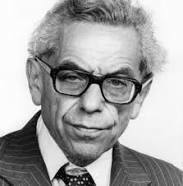 Having written many hundreds of papers Erdös became history's most prolific mathematician. He wrote over 1,000 research papers, more than any other mathematician. The previous record was held by Arthur Cayley, who wrote 927.